I’ve been using the Nepal Evo GTX for a few years now but recently had the opportunity to try the new Nepal Cube GTX (these names are a bit of a mouthful… let’s go with Evo and Cube for simplicity). This new addition to the Nepal line-up not only looks way cooler than my old Evo’s (and you have to admit that’s an important feature) they’re really a step up in performance. On my first day out with the boots my climbing partner noticed that I had them, as he was also wearing the same boots (a bit of a style pho-pa I know) which subsequently led to an approach conversation on the merits of the Cube’s as compared to the Evo’s. My friend’s comments went something like “So you have a pretty good boot that fits well right, how do you improve it? Make them lighter. Make them warmer. Possibly add some rigidity in the sole. That’s what happened, the Cube’s are basically an Evo that is lighter, warmer and more rigid… they even seem to take up less room in my pack!”. Well he’s obviously sold on these boots, so what did I find? The author testing out the Cubes. Photo by Raf. Well let’s start with a little technical mumbo-jumbo… just a little. The Cube’s have incorporated many of the design features and materials of the Evo’s. They have the Nepal last, have kept the same silicone impregnated leather uppers, lacing system (3D flex ankle system), removable-adjustable tongue and Vibram soles with Impact Brake System to name a few. Where they start to differ is that the Cube’s are 12% lighter (894g vs. 1012g), they have a 2mm midsole and a 4mm EVA foam insole which is stiffened with Carbon Tech honeycomb where the Evo has a 9mm insole and 8-9mm midsole. The midsole thickness difference is obvious when compared side-to-side. Cube is on the left and Evo on the right. So what does this mean? Well, the lower profile increases dexterity and stability which really means they feel a little less clunky. Being almost 12% lighter also contributes to making them feel less clunky but also makes a huge difference in effort over a long day. 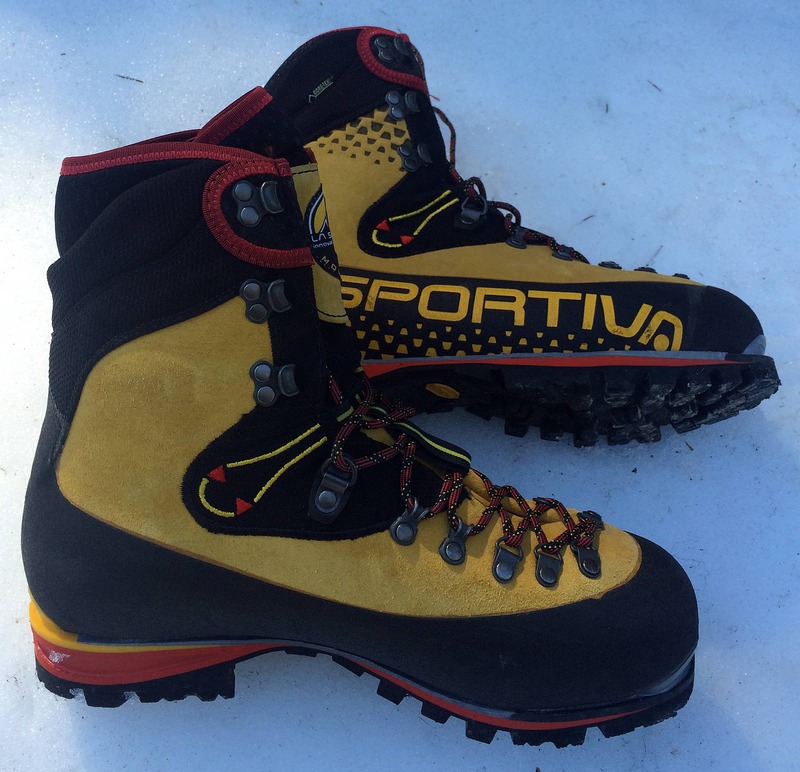 The differing insulation in the sole seems to be a bit warmer as I didn’t feel my feet cool when I put crampons on. However, without wearing one of each for a day it’s hard to know for sure (if we see any more winter this year I will give it a shot and write an update, otherwise I’m just going rock climbing). Being easier to resole makes them a little more environmentally friendly not to mention more wallet friendly over the long run, though they cost a bit more upfront so it will be harder on the wallet in the short term. The volume is about the same so I don’t think they take up any less room in the pack, though. When viewed together the new Cube’s look really shines. A little comment on the fit of the boot, the toe box is basically identical to the Evo but the heel feels a bit different. I believe this can be attributed to the differences in the mid and insoles. For me this has not been an issue as both seem to hug my ski-boot ravaged heels quite well, though I have spoken to one person who didn’t like the subtle change in the heel fit. For me the pro’s far outweigh the cons for the Cube and make this a no-brainer. I want to confirm the additional warmth claim with more testing but the boots are significantly lighter and feel less clunky which makes up for the small increase in cost even without considering the fact that they are easier to resole. If you have any thoughts on the boots, especially on the warmth aspect please let me know. 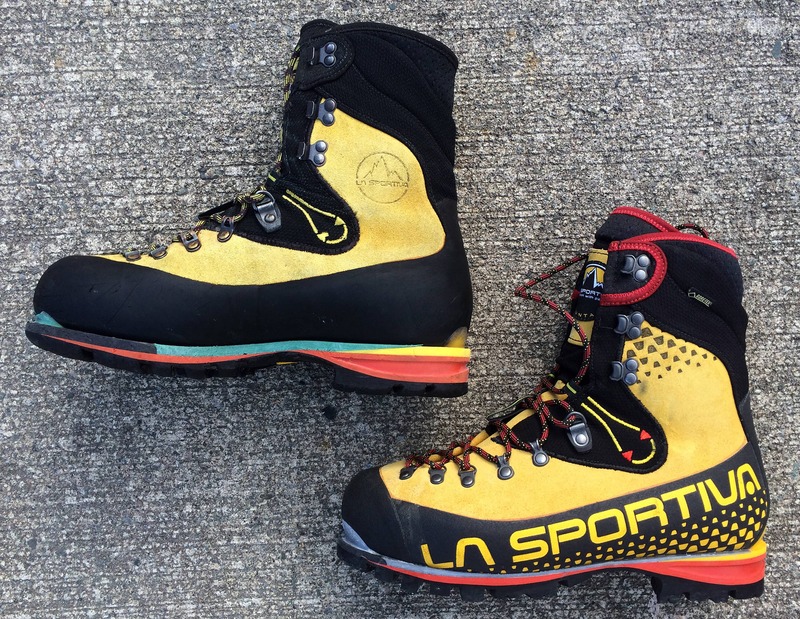 La Sportiva provided a sample for review but this did not influence the review in any way.